This financial thriller intrigues with its vivid plot and beautiful lead characters. I enjoyed The Banker’s Wife so much that I bought the book on Kindle even though I was given the hardback. Okay, that’s actually a stretch; the complimentary copy had smaller print than I prefer. 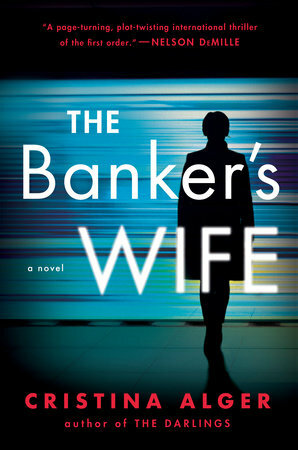 Still, this was an interesting novel, especially for readers who like financial thrillers. The author, Cristina Alger, does not get too bogged down by financial jargon. Her premise is simple: There’s something rotten at Swiss United. Although a book about foreign investment bankers may not have universal appeal, there is sufficient conflict and gnashing of teeth to keep the plot moving. Besides, who doesn’t love gorgeous damsels in distress threatened by a cadre of unsavory, filthy rich thugs? Just the idea of the clandestine works of the Swiss banking system is enough to generate intrigue. When you add in a billionaire financier who has no political experience, not to mention a suspect past, running for president of the United States — Sorry, Ms. Alger, but who would believe that? — then you have the necessary elements of a good story. The protagonists are Annabel and Marina, two young and extraordinarily beautiful women. Annabel is married to an investment banker, and Marina is engaged to one. Their stories are told in parallel fashion: a chapter for Annabel, and then it’s Marina’s turn.